Process Connection is a 1½"-16 AMP Tri-Grip (Tri-Clamp® Compatible) Standard, Other Sizes and Styles Available. Flanges Conform to ASME BPE-2007 Standard to Assure Trouble Free Interchangeability. Click on this link if you need more information about Sanitary Sensors. 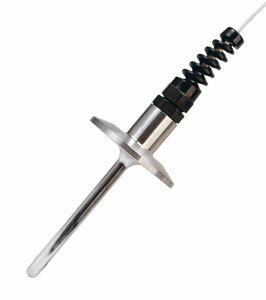 Probe lengths of 3, 4, 5 or 6 inches available from stock, other lengths available as special orders. This Sanitary Temperature Sensor containes a PT100 Platinum RTD element and is designed for use in Food, Dairy, Beverage and BioPharmaceutical Clean-In-Place (CIP) type applications. The sensor includes a 1½" 16AMP process connection that conforms to ASME BPE-2007 for easy installation using industry standard gaskets and clamps. Standard Duty sensors are available with ¼" diameter probes, and Heavy Duty sensors are available with a stepped 3⁄8" to 3⁄16" diameter probe. This sensor is provided with a 120" long, 4-conductor, #26AWG stranded nickel plated copper, PFA insulated and jacketed cable with a strain relief for convenient connection to control or monitoring equipment. These sanitary sensors are supplied standard as 4-wire assemblies with two red wires and two white wires. When used in 3-wire applications, cut off one white wire making sure that it will not contact any terminals or metal surfaces (note: twisting the two white wires together will reduce the lead wire resistance on one side of the sensing element by half adversely affecting the accuracy of the reading). When used in 2-wire applications, cut off one white wire and one red wire (note: in 2-wire applications, twisting the two same-colored wires together at the terminals will not adversely affect your sensor accuracy since both wires will be affected by the reduction in resistance). These sensors are also available in Thermistor and Thermocouple styles to accommodate any process input requirement. Miniature Connectors for Pt100 and Thermistor RTD Probes, Series "T"